Re: 807 (maybe) amplifier build. Thanks Colin, didn't think of Birkitt's, will take a ride over one day. Thanks to help from wd40 I seem to be getting somewhere, the front end, LTP PS and driver circuit is working well and could drive a six inch nail through a brick wall, metaphoricaly speaking. I'm getting 80w which looks flat from 100hz to 20khz with about 5% THD, which is mostly 2nd harmonic from what I can see. with a 1khz square wave there is a spike on the front edge. With that out the way for now ( I'll need to go back and tweak it for lower distortion perhaps etc) when the OP clips, it's followed by Xover distortion and the OP power drops. It's not the PSU, that's rock steady. Am using a TEK 120-0140-00 power tfmr ( see - http://www.pmillett.com/Tek_xfmrs.htm for full info) using taps 5-10 113v @ .5A and 20-21 180v @ 320mA paralleled with 3 x 220u 500v caps on each winding. I've noticed that I get different clipping and Xover distortion with different grid resistors etc. 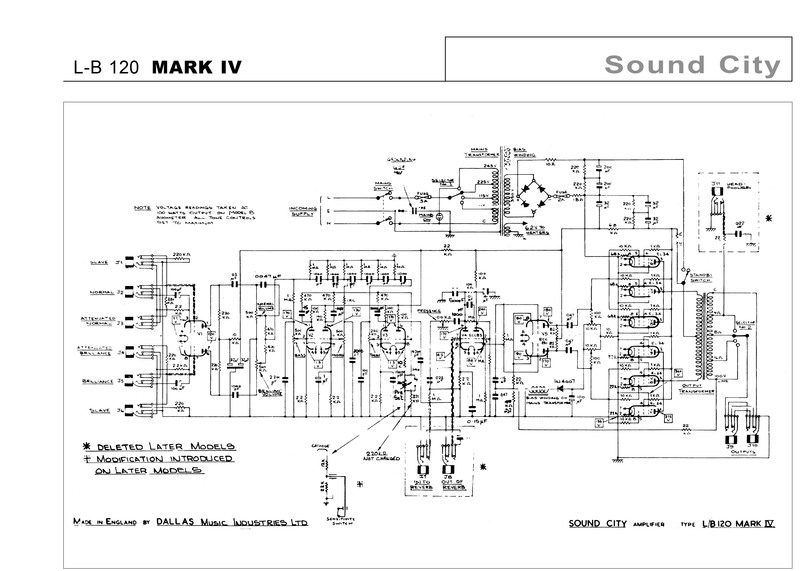 I've looked at the Marshall VBA400, the Ampeg SVT 400 and a few other schematics to see how they configure the OP stage. There seems to be two ways the negative bias has been connected and the grid R's are terminated. Most have the 2 (or 6) grid resistors of each side connected with the neg bias also connected at this point. The other way is to split the grid R ('s) connect one end to ground with the neg bias connected at the junction of the two R's. I'd appreciate comments on the two approach's. The other differences I've noted are some (most) have a grid R on each grid, same goes for coupling caps, other's notably the GEC 400w has two coupling caps and two grid R's, very simple. Lastly, most use a 220/270 scr grid stopper. I'm a bit stuck here as I can't find any info regarding the design of multiple valve OP stages, for instance I presume a resistor is put on each grid, then that means they are in parallel looking from the driver's, does it also follow that the coupling caps are in parallel too? TFL (thanks for looking) any comment's advice welcome, Andy. Signal wise all the grids of each half of the output stage are in parallel, so if all the valves were identical, the grids could simply be paralleled up. Unfortunately..... there is a need at least to have some means of balancing up standing currents- hence the variation in separating grid bias from signal feed arrangements. There is also added complication with stopper (series) resistors in various grid circuits to try to stop the whole shebang from taking off. Back in the days, I suspect it was easier to get reliable high power audio using bigger valves from the RF world than multiple pairs of smallish audio valves. Also for large audio installations like cinemas etc you could get at least 10dB more bang for your amplifier buck by using horn loaded rather than direct radiator loudspeakers. I suspect that very rarely was more than a few hundred watts of electrical audio required for anything. However note I altered the feedback arrangements and it has Partridge transformers so performance is stonking! Re balancing standing currents Chris I've tried trimmers on each valve which is a nightmare to balance, it's like trying to play whackamole. After some thought on this there are only two ways to go to get more power, drop the UL config and bung up to 600v on the anodes or use different valves. Can't afford KT88's or 6550's but do have a few EL34's. I knocked up another temporary chassis yesterday, will report back. That schematic is interesting, I see it uses an ECC81 as PS and no cathode followers.They usually use an ECC82 as the PS, the ECC81 has slightly less gain. I found it was hard to drive 6 valves without cathode follower's. BTW Paul, do you know what the OPT's Ra-a is on your amp? I have a few David but they're overkill for this job and not compatable with the OPT. THe problem with valves is that when you want to up the power, you either have to parallel a number of devices and then get worried about matching and current sharing, or you are forced into higher power devices running much higher HT. Scary HT. I wonder if it's a case of keeping the cathode current and area within bounds where they can be sure of the current density being shared well across the area? The directly heated nature of a lot of the powerful beasties is another inconvenience. I keep suggesting 3-500Z to audiophiles. Triode, check!, directly heated, check!, looks the biz, check! Anything that looks like that ought to sound awesome, using their logic. But really, I'm just thinking of the top cap anode connections and the kilovolts they sit at and the possibility of thinning the ranks of the audiophiles a bit. I designed my last valve amp in the early 1980s. Lots of TV line output valves in parallel with two groups operating as a totem pole output stage, DC coupled, no output transformer. The stereo pair was monstrously big, but it was done for a purpose: To investigate the differences between no-holds-barred designs based on Valve, Bipolar and MOSFET technologies. It served its purpose and the bits got recycled for other purposes. I couldn't hear any difference between the three when I didn't know which was in use. I thought I could when I did know but that was probably my own suggestibility. I tried other people. Some musicians, some audio hobbyists, some uninvolved people. So the Mosfet beast has sat in my living room, beside one of the speakers for over 35years. It just works, and works well enough that I don't feel any need to go further down that path. I was comparing three no-holds-barred designs each having had no corners cut or costs saved. I wasn't comparing a complex semiconductor job against a minimalist valve job. That said, I think designing a reasonably acceptable valve amplifier is a good deal easier than designing a comparably acceptable transistor one. But when you account for component availability I think it's a skill worth acquiring..
For me, hifi should be fun but some other people take it far too seriously. There was a quotation of a Mr Shankley after someone had said that football wasn't a matter of life and death "No, it's more important than that." was his qui, but he had a sense of humour. It's the people without that which worry me. So, if your 807 amplifier is just for the hell of it as a learning exercise, then go for it! My PA120 is 1.25K A-A. so basically the datasheet EL34 push-pull value divided by 3. Returning to the 807 datasheet for an anode voltage of 400v class AB1 they recommend 6800R A-A, so 2.26k for a sextet. Your 1900 should be near enough - it's not an exact science. However they quote 36w @ 400v so your sextet power should be approx 108w. This would be straight push-pull not ultra linear, and with G2 at 300V. Suggest you give it a try. Put a 10R resistor in each cathode. This will allow you to measure bias current and also act as 'fuse' in case of disaster. Higher powers are obtainable with higher anode voltages, however the required primary impedance goes up so you would be back where you started. Might I interject with a daft question? If you want a lot more anode-anode resistance and for the time being you only have one OPT, what's to stop you just putting a good few drivers in series on the secondary? That will indeed change the resistive impedance presented between the anodes, but it won't scale-up the inductance of the primary. So, the frequency response at the bass end will be curtailed by the same factor as the scaling of the resistive impedance. I'm finally getting my head round this. In UL I'm limited by any valves screen grid Vmax rating, which for a lot of big beam tetrodes, IE 807, 6146 is 300v, so as WD suggests unhook the UL tap, put 300v regulated on the the screen grid's and higher anode voltage and we get more power, but loose the better THD. I would get more power if this OPT has a higher Ra-a, about 3k would be about right. Or we can use a valve like 6L6GC or EL34 which have higher g2 max, however I've found that setting the neg bias point is tricky. To avoid Xover distortion you have to set fixed bias around -35v, this gets more power putting the valve further into class A, but the valves quiescent cathode current is sitting pretty high, at around 60 - 80mA. Pushing the valve into further class A looses power, so there is a sweet spot. On my amp I have a pot to adjust the fixed bias, at around - 40v Xover distortion occurs earlier, but I can push the amp to 130w no probs, the OP sinewave is very distorted though; lot's of Xover distortion, lot's of third, fifth H.
So for any AB1 PP amp at low power the amp runs in class A, but with a big amp like this one, the amp runs in class A at a higher power. We could just use a KT88 single ended for pure class A, or why not an 813 triode strapped SE amp? : ) I agree with David and others that BJT's or mosfet's are the best way to go to build an amp. I love valves, with my romantic hat on, there is no comparison between a 807 say and 2N3055, in looks the 807 is the mutts nuts. But with my green hat on I shudder at the nearly 1amp it takes to get the thing working, not to mention all the copper for the OPT. I think Pete Millet worked out that a valve amp is only about 18% efficiant. That said I'm building this to learn and it is fun sometimes. I put some music through it yesterday and it sounds lovely. This pile of glass with wires sticking out all over the place works, can't quite believe it, it's a good feeling of achievement. I wouldn't have been able to make a transistor amp, but the stuff I've learned building this will stand me in good stead when I have a go at one, which I plan to do next. Anyhoo, here's a link to a short video I made - https://www.youtube.com/watch?v=jX_iQiqzmW8. Thanks again for all your tips and interest, Andy. I think if I were feeling a bit unhappy with myself over the green angle, I might save a device like this for winter listening - heat isn't wasted if you need it! I've read this thread with interest - I've been collecting bits to build a guitar amp - or since I've been reading, probably two, SE first and then P-P. I've got some audiophool valves in a shoe box from years ago, but I have some Russian devices too (ECC83, EL84, 6L6 equivalents) and it will be fun to see if I can do what I want to with those. But unlike you I'm going to go for low power because I want to wring its neck without having to wear ear-defenders. Video doesn't seem to work, or is that just me? The vid isn't working for me, either. "This video is not available. Sorry about that." Regulated G2 is an under-explored backwater. Partridge of transformer fame proposed a series regulator valve just for G2 voltage. Not used much in the commercial world, but Grommes used it in their 260A power amp which has a 6L6 just for screen regulation. Sometimes known as the 'Partridge control valve'. With regard to power output in UL mode the valve isn't fully in pentode mode so power is a little lower, but you're trading this off for distortion. Slight tangential query here- I've long wondered about the g2 voltage limitations in RF PA specs- e.g. the 807 being quoted somewhat lower than the supposedly originative 6L6. I wondered if this was more to do with limiting screen dissipation or, more exotically, to hinder the tendency to B-K parasitics, when the anode has a tuned, resonant load subject to large-amplitude negative excursion than any straightforward clearance limitation. If so, that would suggest that higher screen voltage would be acceptable when an RF PA-marketed valve was used as an AF PA- say a 300V spec. limitation becoming more like 400V? Subject to the usual considerations of g2 dissipation, use of stopper resistors with high-slope valves and high g2 voltage and so on. This page, scanned from the RCA Tube Handbook, may be of interest. That's interesting Dave, I asked around about putting more voltage on g2 of the 807's and the consensus was it's ok as long as the max power limit wasn't exceeded. As g2 is tapped off the 43% tap, it's running at lower power. I ran the 807's at 400v HT and didn't experience any problem's. Still didn't feel comfortable about it though. Devices be they IC's, transistor's or valves are from what I've gleaned conservatively rated on datasheet's. Take the power max of 25w of the 807 for instance ( "This rating is absolute and must be reduced under certain conditions" like AB2), on the STC datasheet it gives example's of running a pair at 47w and 80w !? Max g2 power is given as 3.5w but the AB2 example where a pair is running at 80w it says the g2 current at max signal is 21mA, which at 300v is 6.3w !? Thanks for the input, video should be working, but isn't brilliant; will upload another. A.